My 17 year old son Sebastian compared me to a James Bond villain last week. Maybe he was referring to Dr. No, or Mr. Big, or maybe even Paco “Pistols” Scaramanga, though I would prefer to be Dr. Evil from Austin Powers. You see, I had inflicted pain on him, and he saw me react in delight. I tried to politely discuss his affinity for video games, but he wasn’t interested in a conversation. So, the more he gamed, the more I stewed. And then on the second day of school, I came home from work and saw him gaming. I grabbed his head phones and jumped on them until they were crushed into 100 pieces. He couldn’t believe my joy. After I regained my composure, I made him a nice bowl of Risotto Cacio e Pepe con Gamberi. I may be Dr. Evil, but Mini Me knows that the real villain is that big screen (and the small one too). Clean and peel the shrimp. If using large shrimp, cut them into bite sized pieces. Set aside. In a large skillet over medium heat, saute the onion in the olive oil. When translucent, add the rice and mix together for a minute or two. Then add 1/2 the wine and allow to evaporate. Lower the heat. Slowly add a ladle of broth and mix together until absorbed. Continue adding broth until all is absorbed, cooking for about 15 minutes. When the rice has a couple minutes left to cook, heat some olive oil in a separate skillet over medium heat. Add the shrimp and then after a minute, add the remaining white wine. Lightly salt and pepper. Allow it to evaporate. 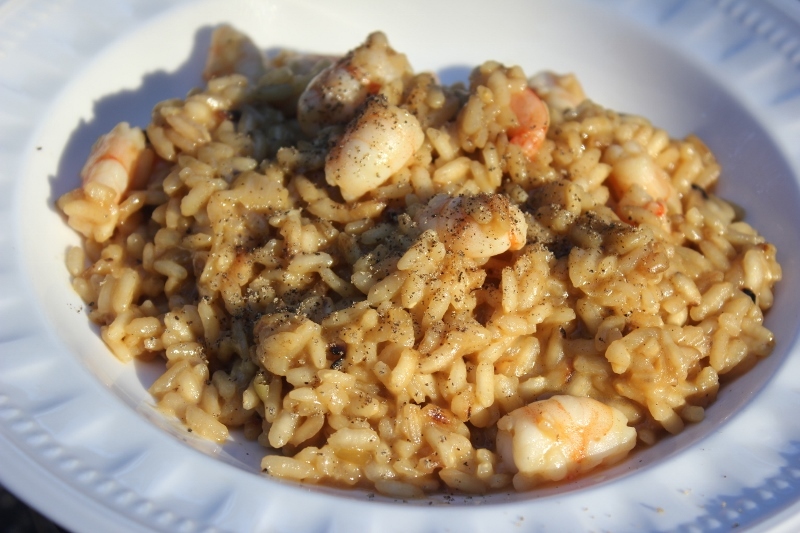 When the shrimp is cooked through (when it turns pink), place the shrimp and its liquid into the skillet with the risotto. The rice should be creamy and al dente. Add the Pecorino and serve immediately with freshly ground black pepper.